Looking for the coolest streetwear clothing at the very best prices? 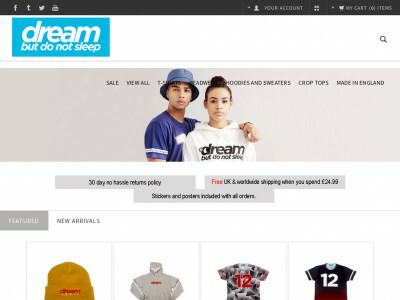 At Dream But Do Not Sleep you'll find a wide range trendy clothing and accessories – and you can get an even better deal with Dream But Do Not Sleep voucher codes. Whether you're buying for the teenager in your life or just after some high quality, comfortable and well-designed items for your wardrobe, Dream But Do Not Sleep vouchers will save you money while you shop. Launched in 2012, Dream But Do Not Sleep is a forward-thinking independent UK streetwear brand stocking a wide range of clothing and accessories. From humble beginnings they have grown over the years to become a big name in the UK streetwear scene, drawing fans both young and old alike. With their roots firmly in the electronic music scene, Dream But Do Not Sleep offers products that interpret a laid-back, positive lifestyle into cool, comfortable clothing for both men and women. At Dream But Do Not Sleep they're proud of their connections with some of the most cutting edge music around, and enjoy support from stars of the scene such as Ben Pearce, xxxy, Synkro, Addison Groove, Pedestrian, Kashii and Happa. These connections mean that Dream But Do Not Sleep's clothing is just as cutting edge as its fans, offering genuinely cool clothing that's coveted by streetwear fans around the country. And because all of their products are hand made in the UK – not in some foreign sweatshop – customers can be sure they're getting the very best quality that's designed to last. At the Dream But Do Not Sleep online shop, customers can browse a wide range of fresh designs and cool fashions, including t-shirts, headwear, hoodies and sweaters and crop tops. Looking for something casual and stylish for relaxing on a lazy weekend? Or perhaps you want a warm beanie hat for keeping you toasty throughout the winter? Whatever you're looking for, you can find it at Dream But Do Not Sleep. And once you've chosen the products that are right for you, the company's dedicated delivery service will ensure your products arrive at your door in record time. Want to get shopping with Dream But Do Not Sleep? With a Dream But Do Not Sleep voucher you can get great deals on their wide range of men's and women's clothing. So whether you're an arch follower of fashion or trying to carve your own path, Dream But Do Not Sleep voucher codes will help you look great for less. Browse our website until you find a Dream But Do Not Sleep voucher that suits you, then navigate to their website to begin shopping. Enter your Dream But Do Not Sleep discount code in the box provided, then click 'Redeem'. If you've enjoyed shopping with Dream But Do Not Sleep, you might also like to check out more great deals on designer labels at stores like Debenhams and TK Maxx. Or, if those aren't right for you, you'll find plenty more stores to browse in our Fashion, Accessories and Jewellery section. Enter your Dream But Do Not Sleep voucher in the box provided, then click 'Redeem'. Enter your details and click 'Bill and ship to this address'. Choose your payment method and click 'Proceed to payment'. Enter your payment details and click 'Pay for order'. Dream But Do Not Sleep offers a range of shipping options including economy and express so you can choose the one that suits you best. Need to speak to the team at Dream But Do Not Sleep? Whether you have a question about your order, want to know more about the company's connections to the electronic music scene or simply want to find out how to make big savings with Dream But Do Not Sleep vouchers, you can contact the Customer Services department by accessing the online contact form here. Want to discover what's happening behind the scenes at Dream But Do Not Sleep? Why not follow the company across all your favourite social media networks? You'll find lots of entertaining content including competitions, look books, promotions and more. You can also use these pages to find out more about saving money with a Dream But Do Not Sleep discount code. Don’t forget to check them regularly, as you can never be sure when a free Dream But Do Not Sleep voucher might be waiting for you! Buy now online at www.dreambutdonotsleep.com.